Some times you have a glut of something left in the fridge and nothing seems to use these particular ingredients so they sit around waiting to go off. That is when I try to create something and regular dishes find themselves having added ingredients. We had a surplus of tomatoes and onions having been given a whole load of each. I was not going to waste them. 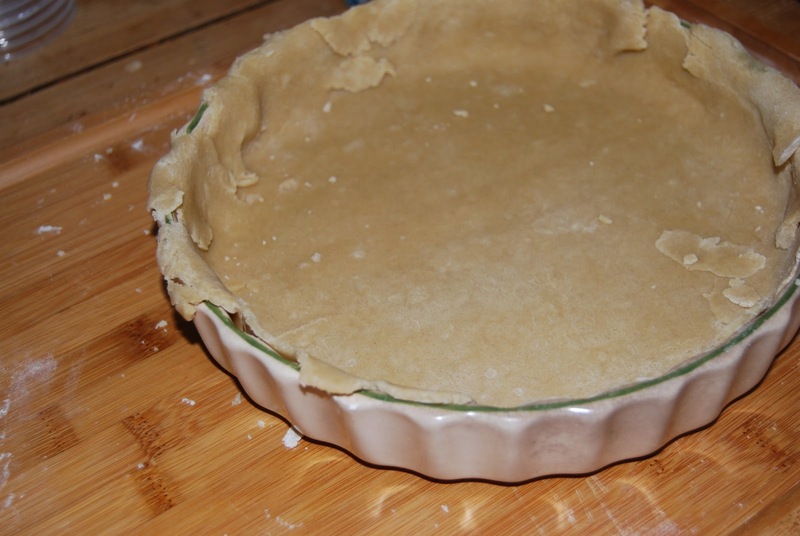 In this instance I had made my own pastry but bought would work just as well. 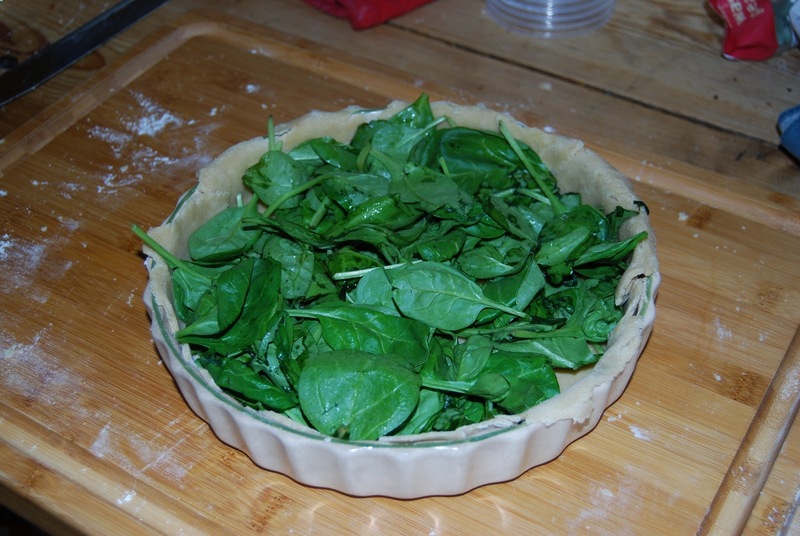 Spinach – I always have this in the fridge and it lines the dish giving it a rich colour but you don’t have to use it. 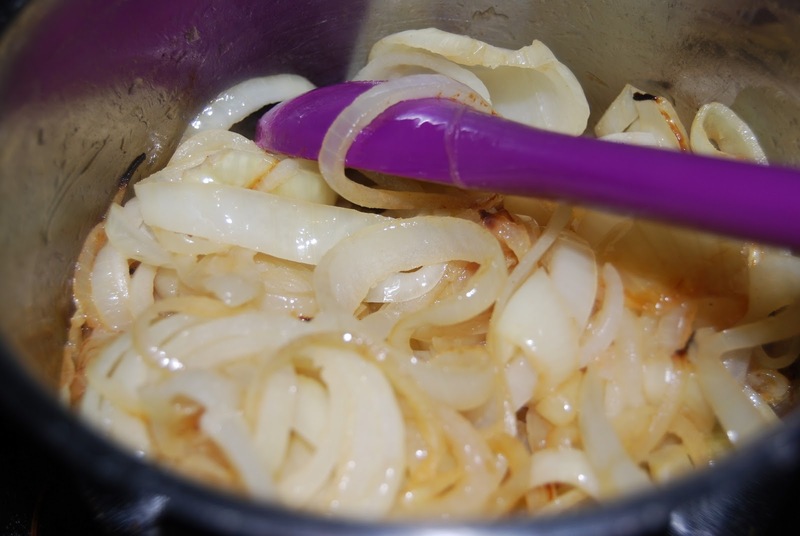 Melt the butter and fry the onions very gently, stirring often so they don’t burn. when they are really soft add the brown sugar and stir in well. 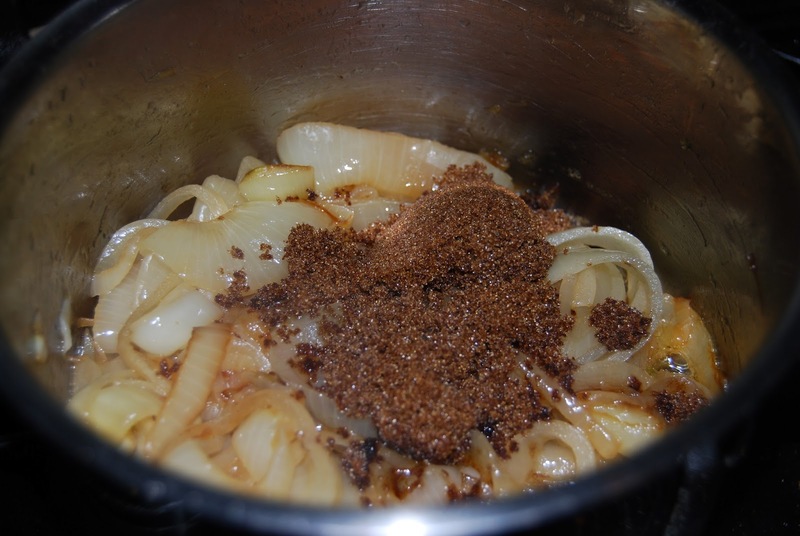 initially it will liquify but keep stirring to coat the onions really well and continue on a really gentle heat. 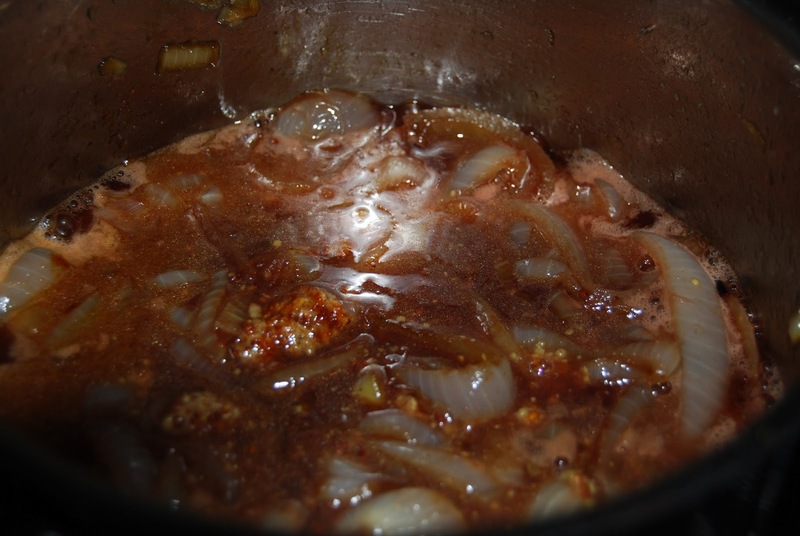 When the sugar has all evaporated and the onions are almost golden in colour take it from the heat and allow to cool slightly. We are now ready to put it all together. 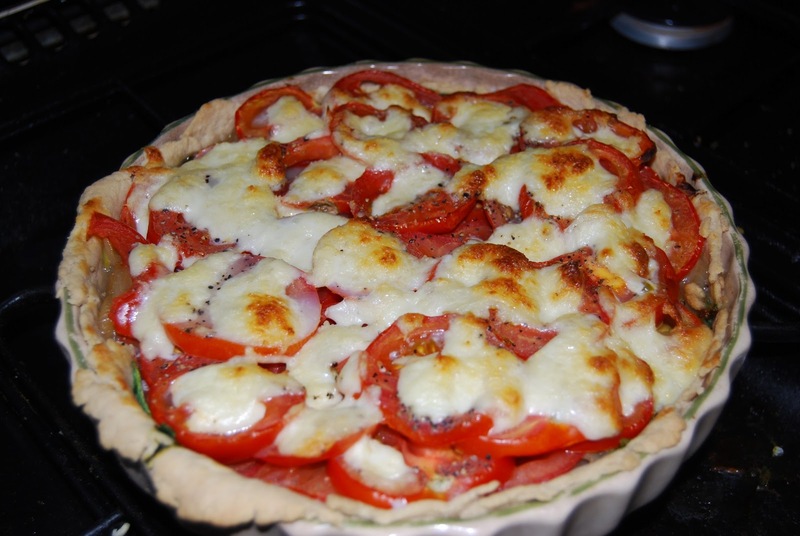 you can build your layers however you want; I like spinach on the base, onions in the middle with the tomatoes spread over the top. This could be repeated if you had enough of the fillings. 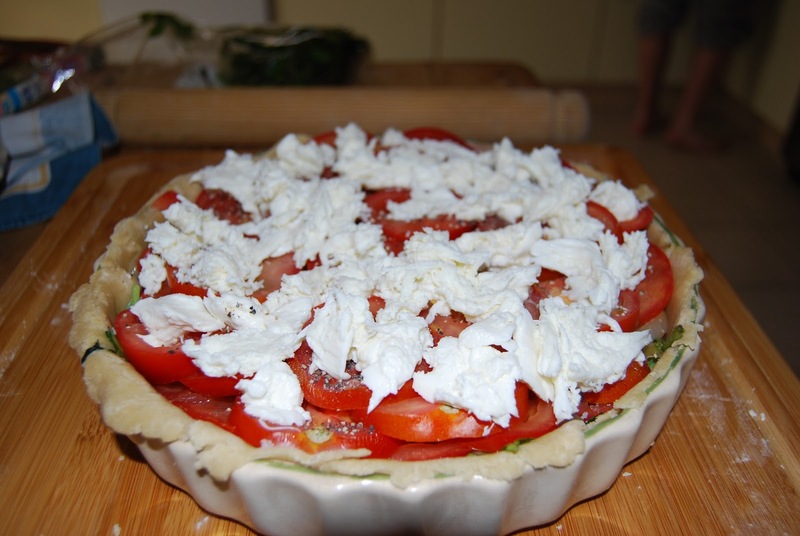 a good covering of mozzerella cheese and the tart is ready for the oven. 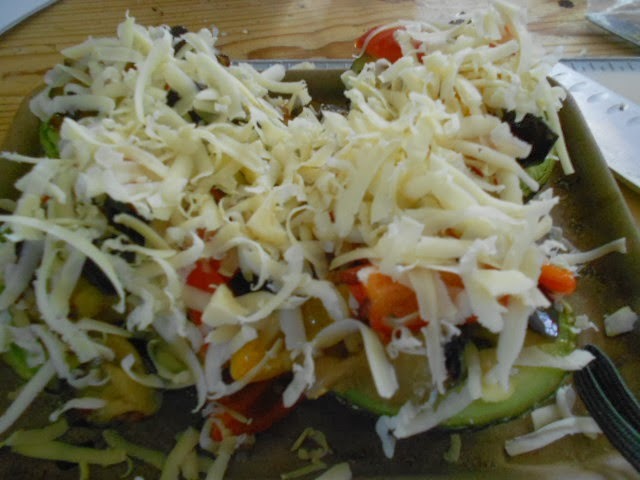 A hot oven for 20 minutes or until the cheese is melting, bubbling and turning golden. The smell of fresh tomatoes wafts through the house and the children miraculously appear demanding food. This makes a great lunch dish or if you have to take a dish to some buffet event, you don’t have to eat it hot. Enjoy and let me know if you have any recipes for using up extra. Not the kind you add to your breakfast toast but fabulous with sausages and any cold meats. It will keep for a while in the fridge so bring it out at BBQ time. This is dead easy to make and I have given the measurements I was first given which will make about 6 jam jars. 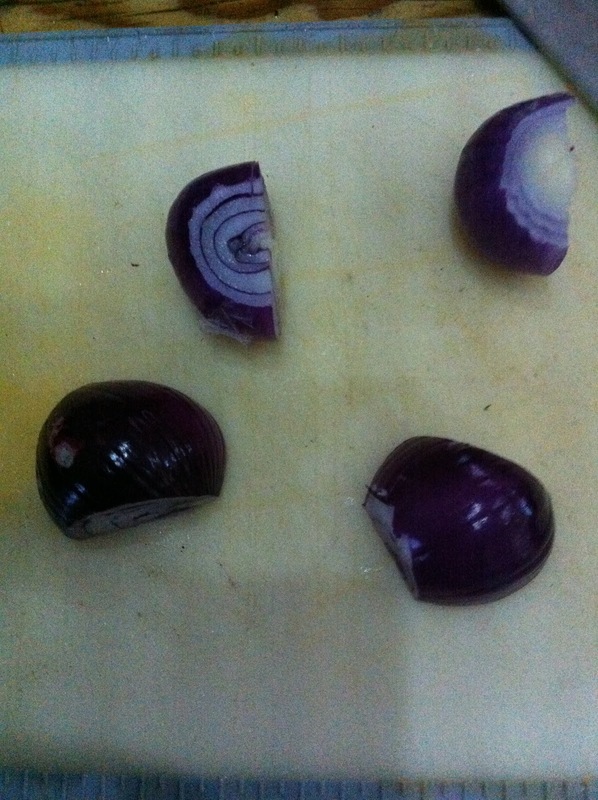 I usually don’t measure and use a few onions the rest is a bit here and there but we don’t tend to make it in big batches. 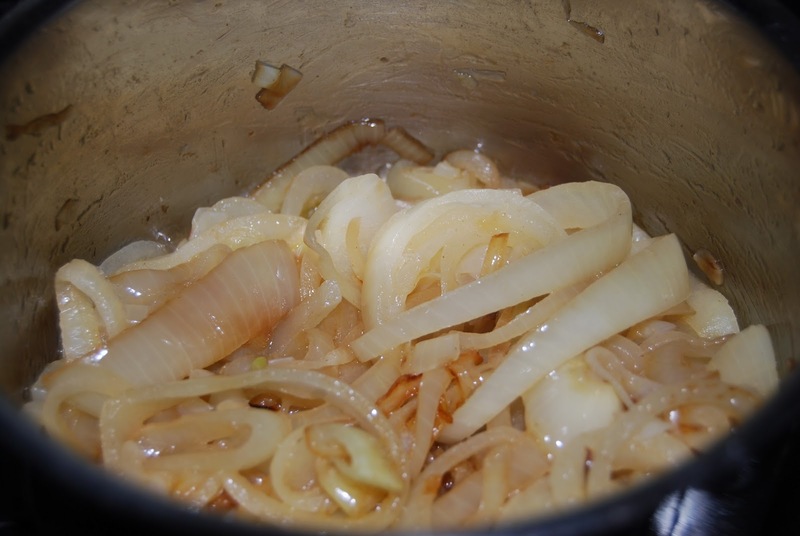 Lower the heat then add the sliced onions. Add all the other ingredients and bring it to a fast boil. Allow the pot to simmer for up to an hour till most of the liquid has evaporated and the consistency is similar to that of marmalade. The smell pervades the whole house and unlike pickle cooking it is enticing and reminiscent of hot dogs. I tend to serve it still hot with sausages but it can be put into jars once cool and kept in the fridge. I always think I have done enough but it still goes. 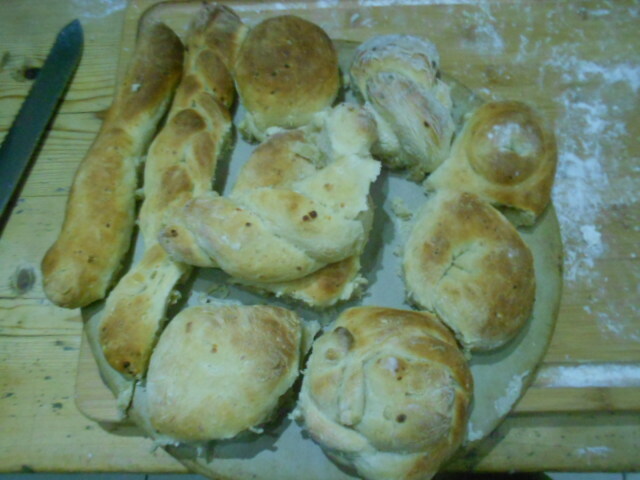 Saturday lunchtime during the cold miserable winter will find me at home having made a pot of warming soup with some home made bread to complement it. 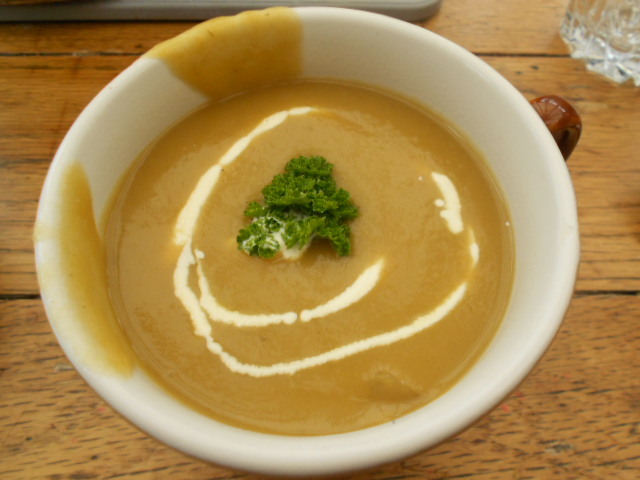 I have a huge repertoire of differing soups but we always come back to the family favourite; Potato (and leek). With three fussy boys and an abhorrence of any kind of green vegetables the soup soon became just Potato; I get away with it as the veg is all puréed at the time of serving. This is quick and simple to make, but like most good soups does benefit for leaving to simmer for an hour or so. I like the ease of hardly chopping the vegetables and just throwing them in the pot. 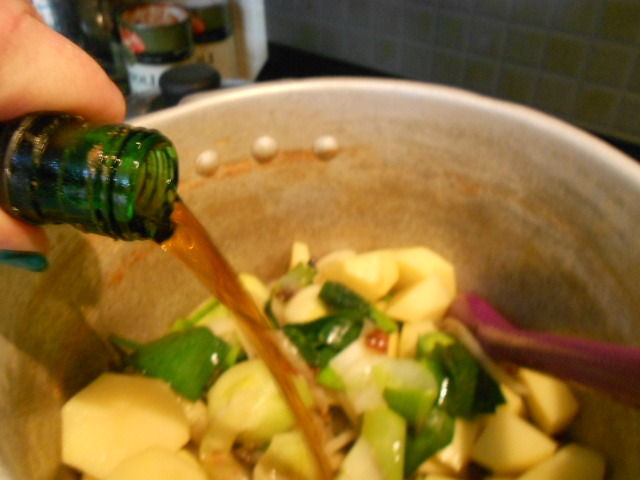 Add the sherry (my secret ingredient that gives depth to the soup). 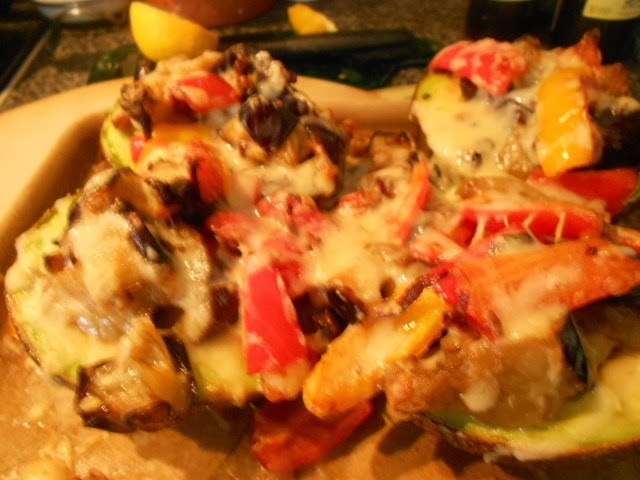 I add a good slug and mix the veg well so they are all coated. 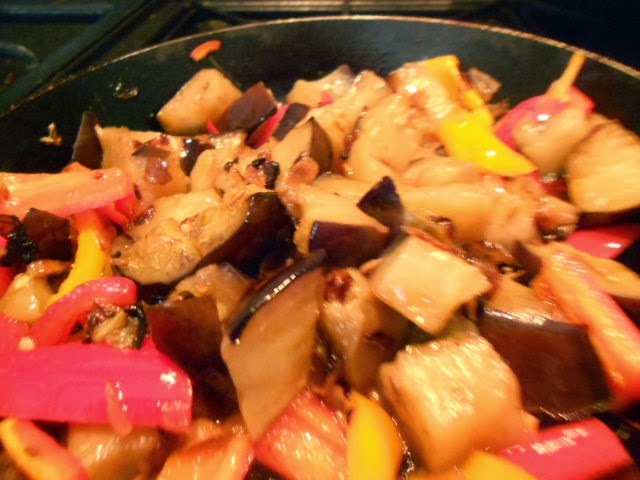 Let the veg cook very gently (low heat) in the sherry till it has all gone and appears almost caramalised. 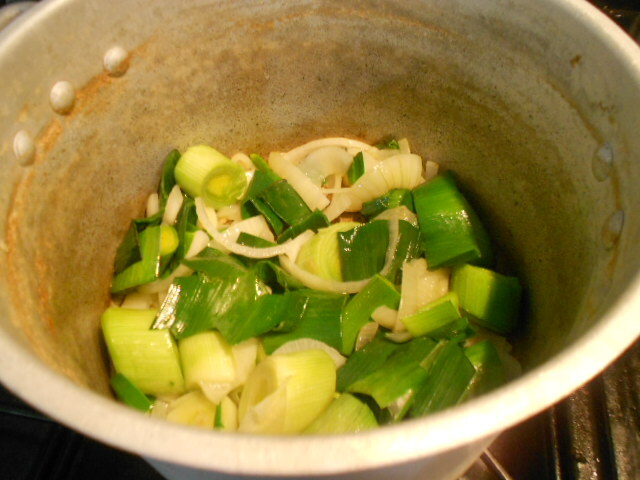 Bring the soup to the boil and turn the heat down again allowing the soup to simmer. 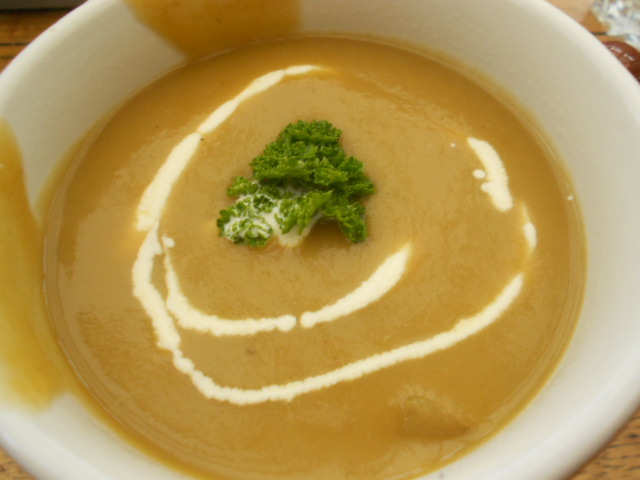 This can be served after the potatoes are soft enough to begin to break down, however the longer the soup is left the deeper the taste. When you are ready to serve the soup, put it in the blender and liquidise it. It should be thick and warming, rather than liquid. 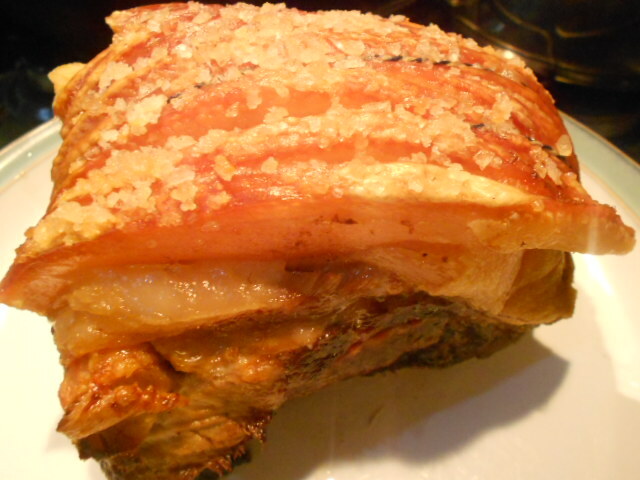 Once upon a time in our household I was the only person to like crackling. Unfortunately; but maybe better for my waistline as I grow older, the whole family now loves it. 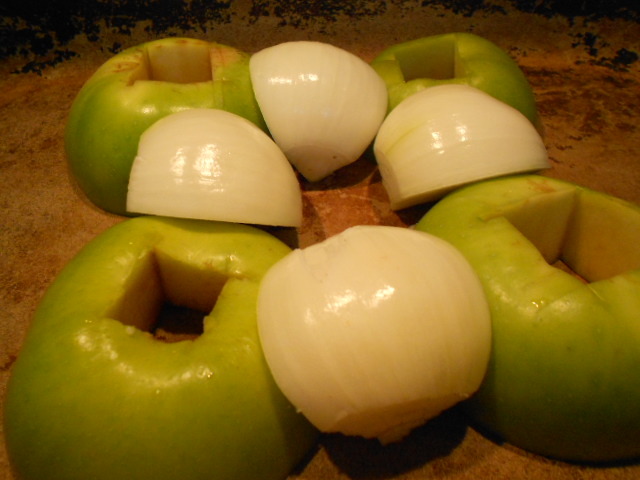 I cut the apples in half and the onion into quarters, this will depend on how many you are using. Place in a roasting dish as a table. Check how the skin is scored. I find I need to cut it to the ends and more thinly than the butcher has done. 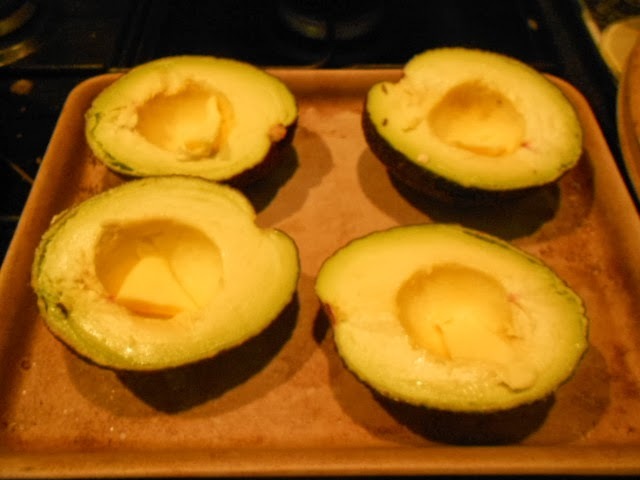 Then smooth the skin with olive oil and salt. Place on top of your bed of apples. Add the water to the base of the roasting tray. 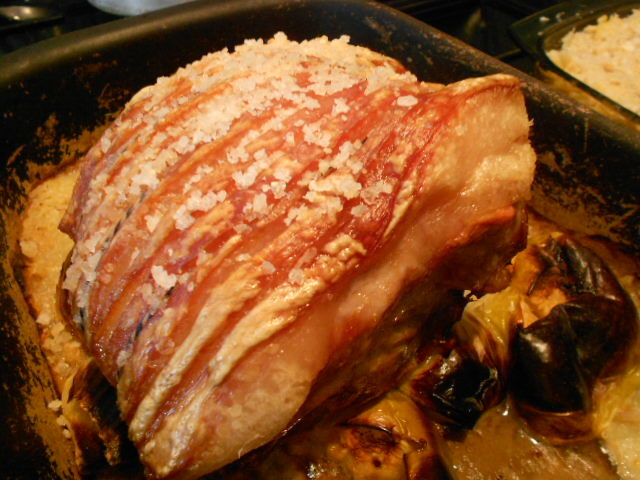 It can cover the apples and onions but should not cover the pork. 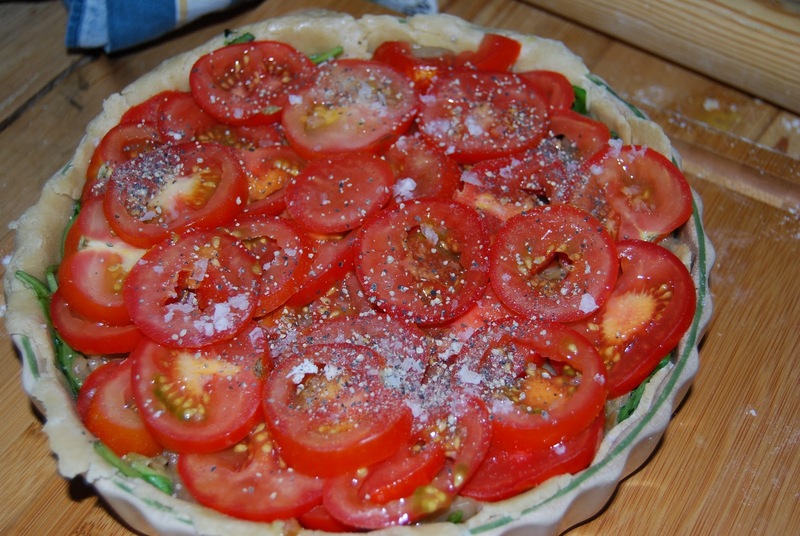 Put it in the oven for about 40 minutes (depending on the size) on high 240C/ gas 9. 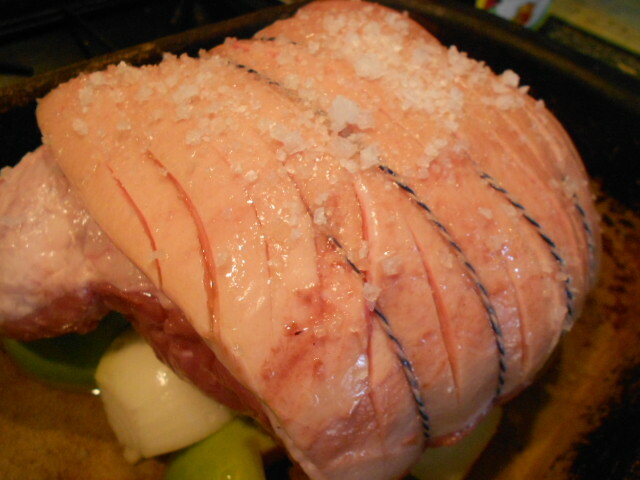 The skin should turn into wonderfully crisp crackling. 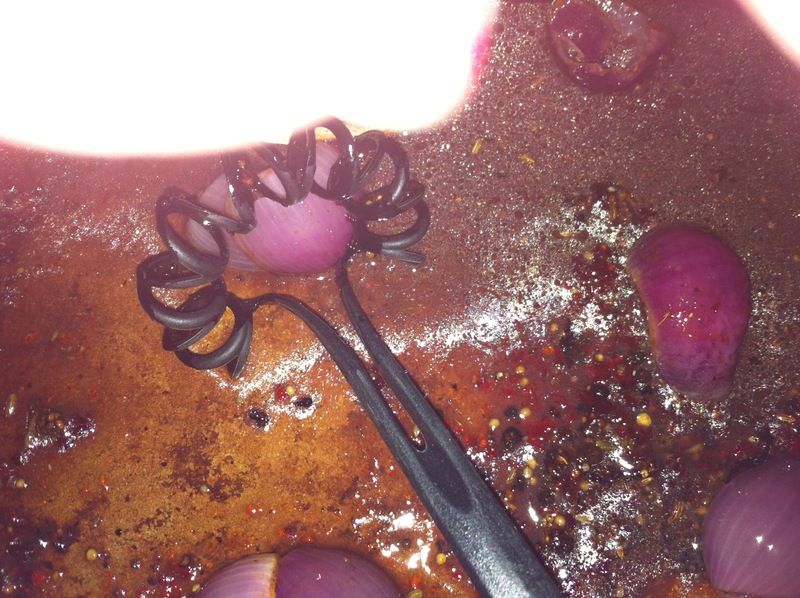 Keep the dish topped with water to stop the joint drying out and the apples and onions from burning. Cover the roasting dish and turn the heat right down to about 150C/gas 2 and leave for about 3 1/2 hours. You don’t need to carve the joint it just falls to pieces and melts in the mouth. Take it out at least 30 minutes before carving to let it rest. It gives you a chance to wack the heat right up again for those deliciously crispy roasties! Serve with all the trimmings, roast potatoes, veg and cider gravy. Taking out the apple and onions from the roasting dish and transferring them to a small bowl you now have your pre-made apple sauce. 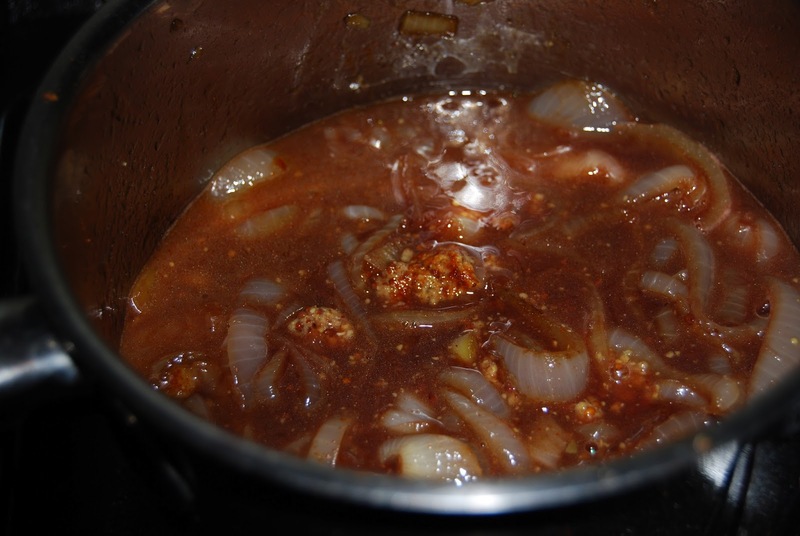 The onions should have sweetened the apples but a touch of sugar could be added if still required. I use the roasting tray to make the gravy, scraping up all the little bits for added flavour. Cider goes well instead of wine in this or use a little apple juice. This is not a quick simple dish. You need to think about it at least the day before and as I made it in the slow cooker it needs all day to cook slowly and succulently. 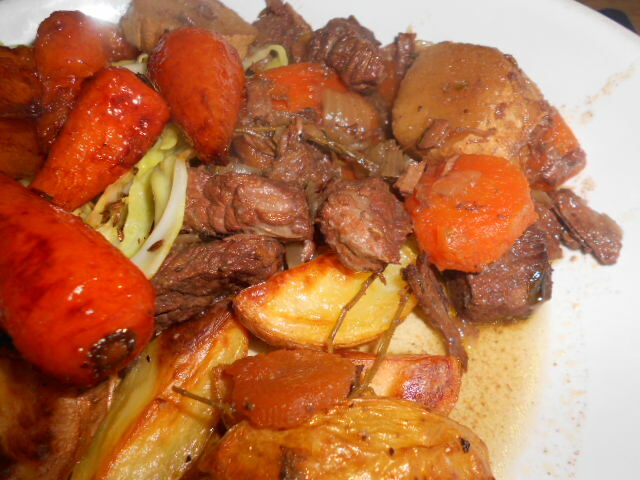 A great dish for a Sunday dinner instead of roast or for a warming meal on Saturday evening after a day out in the cold and wet. 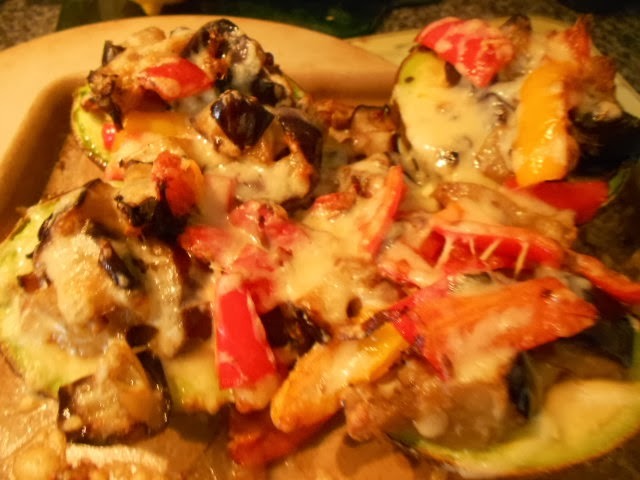 After marinading overnight and then all day cooking the meat just melts in the mouth and the vegetable all fell to bits. 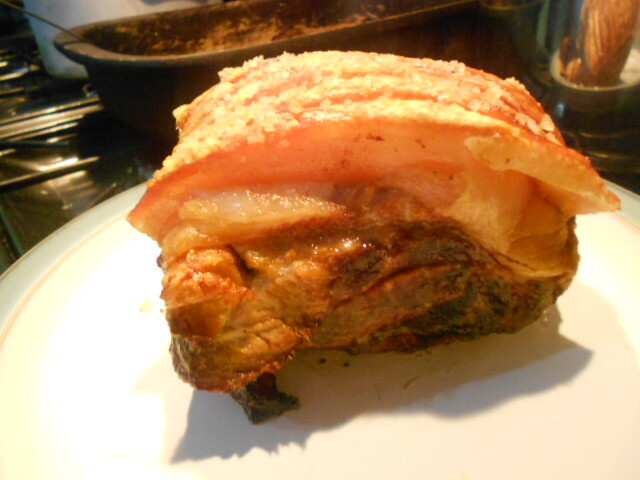 I served it with roasted skins, caramelised carrots with caraway cabbage. Put the meat into a large basin and cover with the whole bottle of wine. Leave overnight in the fridge. 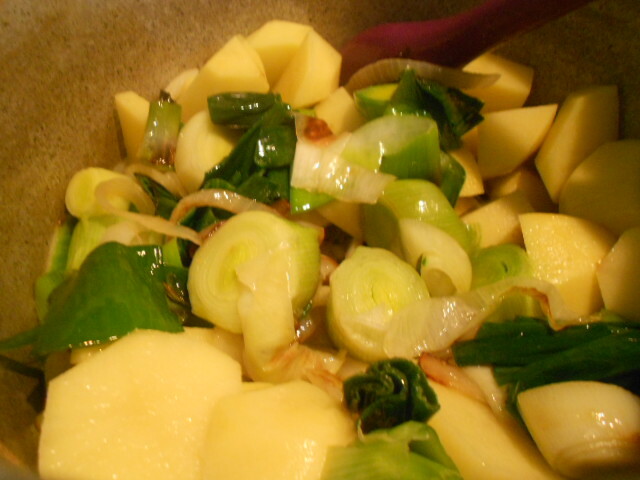 Chop the vegetables and lay them on a small slug of olive oil in a warmed slow cooker pot. Drain the meat but reserve the juices. 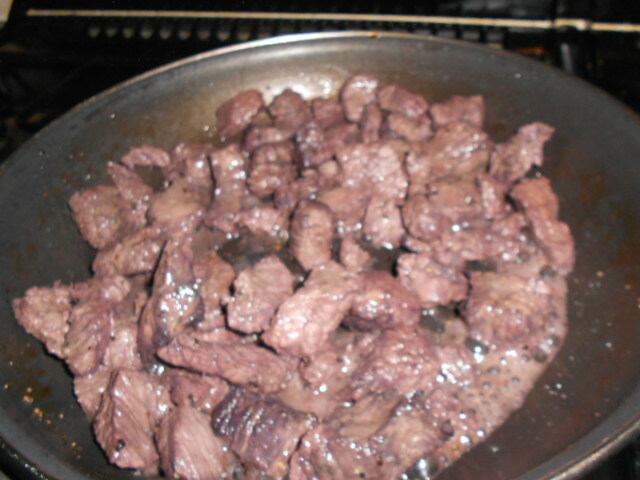 Fry the meat in a separate pan to seal it. 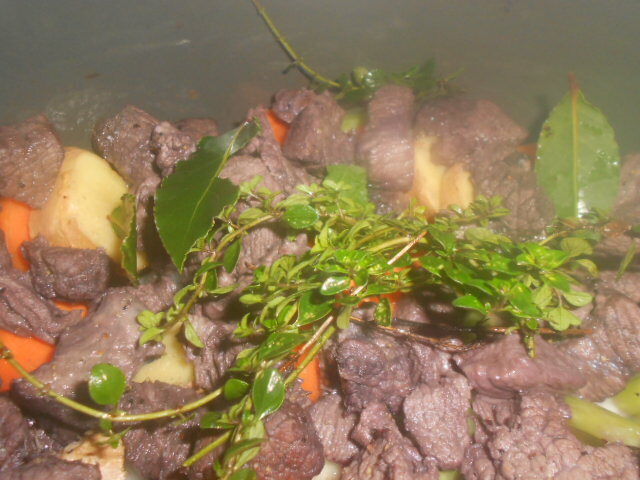 The meat will already be deep in colour having taking in the flavour of the wine. 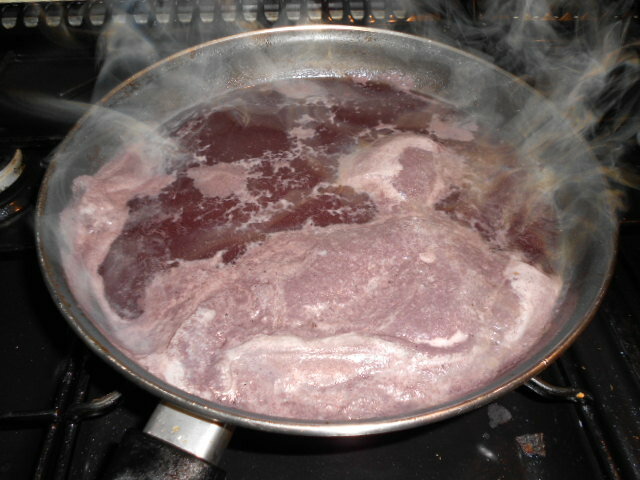 In the same pan add the remainder of the marinaded wine and and bring to the boil. 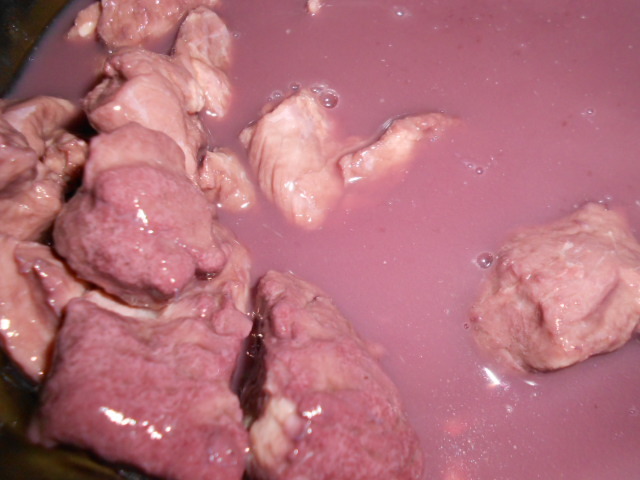 Once boiling a scum will form so remove this and use the rest of the liquid to cover the meat mix. Add the Thyme and Bay leaves. 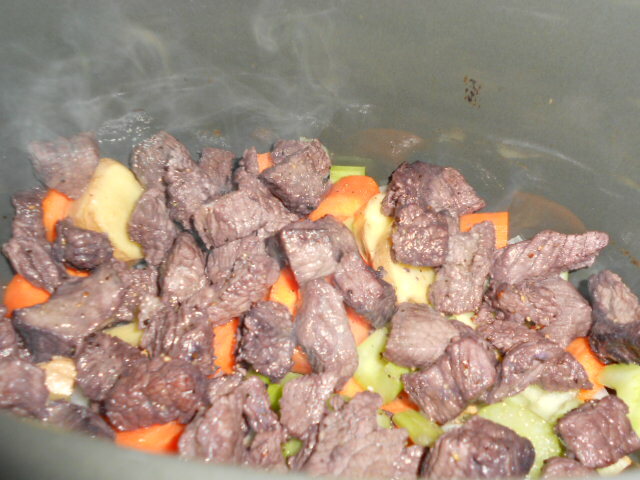 Cover and leave cooking for several hours. 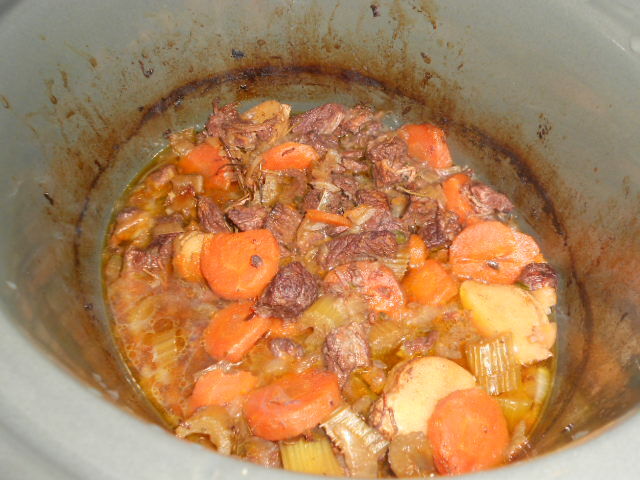 At this point if I was cooking the meat in a conventional stewpot in the oven I would add a quantity of stock, (beef, chicken or vegetable) to stop it drying out at all, it can be cooked off later but better to keep it moist whilst stewing. I left it cooking on a low heat for 6 hours and it was heavenly, but you know your cooker best and you know your lifestyle and when you will need to eat. You could add a few potatoes (new would work best and not mush up). Leave them to cook in the juices so you could just come in and serve. This went down so well and had lots of subtle rushes of flavouring. I had planned to have it again for lunch the next day but it all disappeared that night. Enjoy and let me know if you can come up with a variation. For the caramelised carrots I used baby whole carrots (it is good to use whole ones anyway rather than sliced, I chose baby ones). Place these in boiling water with a good handful of butter and sugar together with a star anise. Let the carrots boil away till the water has all gone and they just glaze over. Serve them without the star anise. The cabbage was the last minute preparation sliced then cooked in just a knob of butter with a handful of pre-roasted caraway seeds added just before serving. Sunday Lunch is the highlight of the week and the time when I like to push the boat out a little bit. 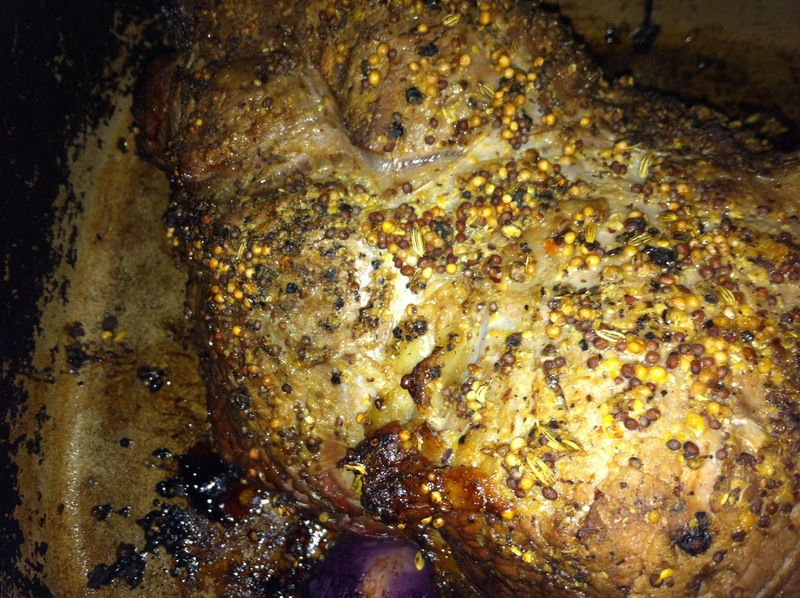 Sometimes I will roll my Beef in Mustard and cook it like that but I have taken to doing it this way instead. 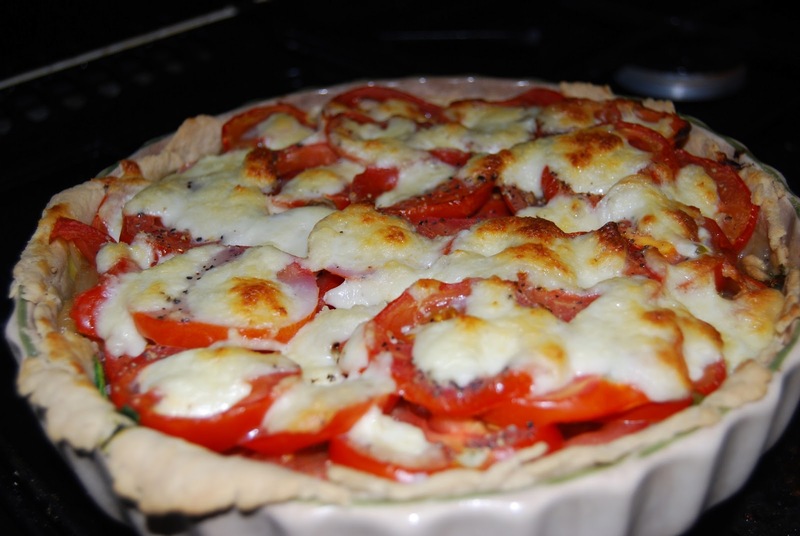 There is no getting away from the fact the crust is spicy, so cut off this for fussy eaters. It surprised me when two of my very fussy children tried this and loved it; they kept returning for more. I have added my amounts in but this will vary on who and how many you are feeding, how spicy you like your meat and how big the joint is. These measurements are a good guideline to try for the first time you spice up your Beef then you can adapt accordingly. 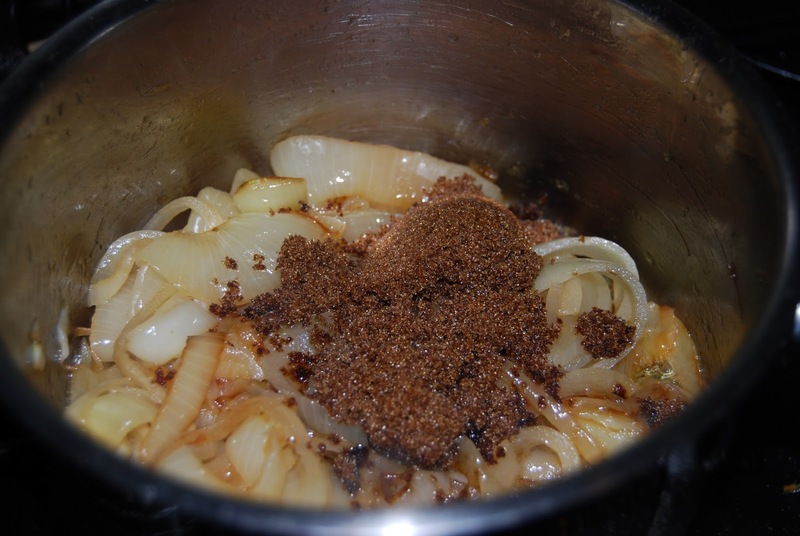 Crush the peppercorns then add the mustard seeds and fennel seeds crushing them as well. 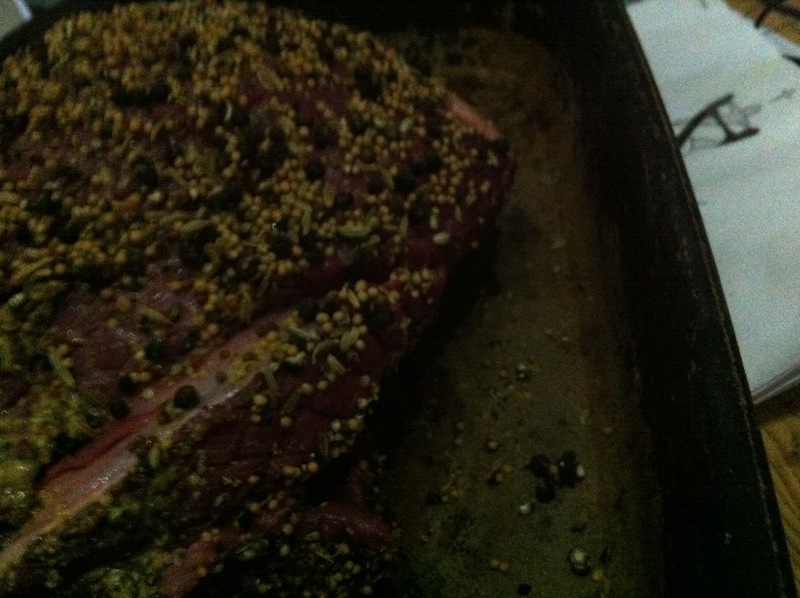 Cover the joint of Beef with oil. 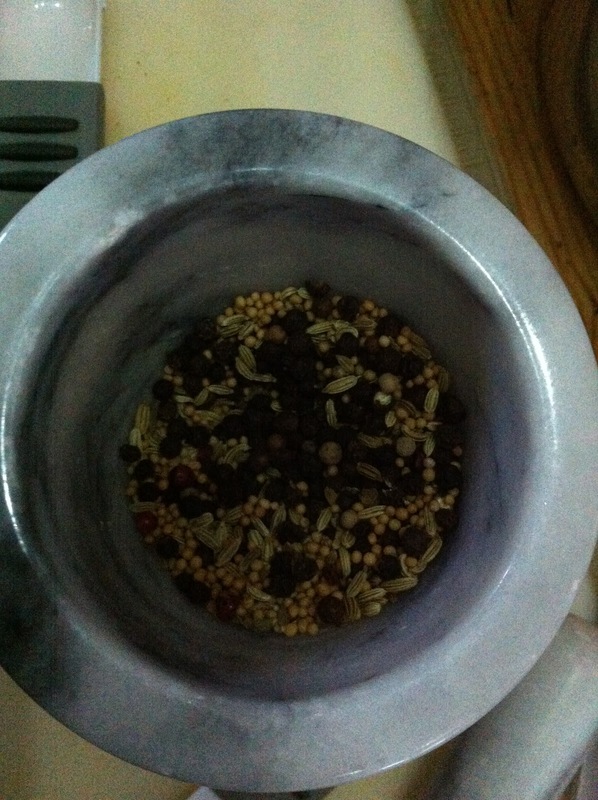 Spread the peppercorn mix over a plate or roasting dish and roll the oiled joint in the mix. 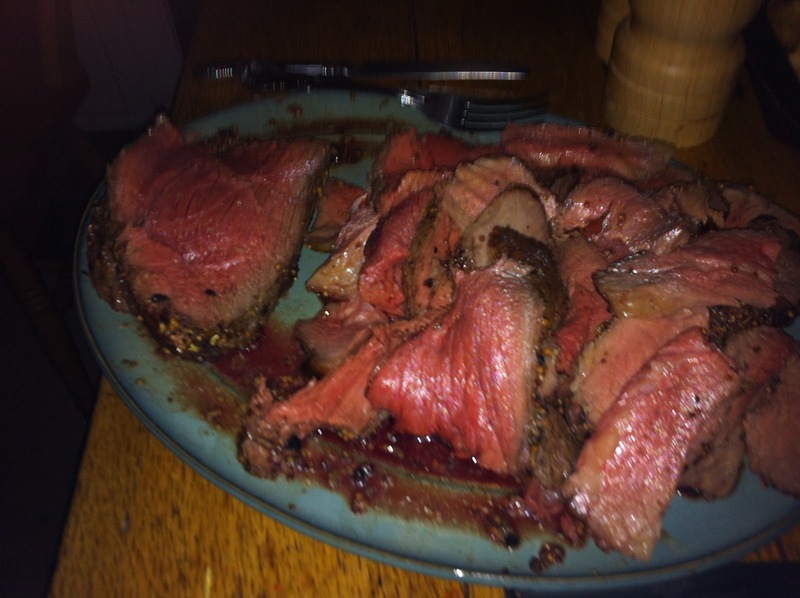 Before you are ready to cook take the beef from the fridge so it can acclimatise to the temperature of the room. 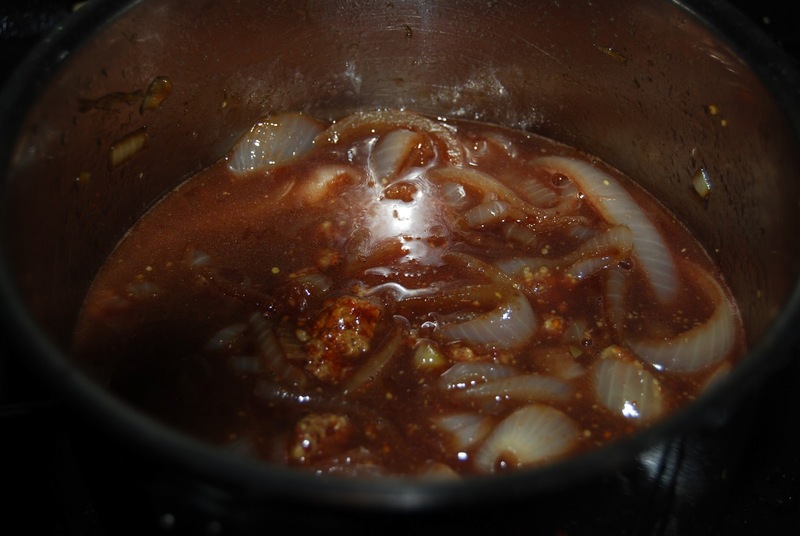 Rest the Beef on the onions so any juices drip down. 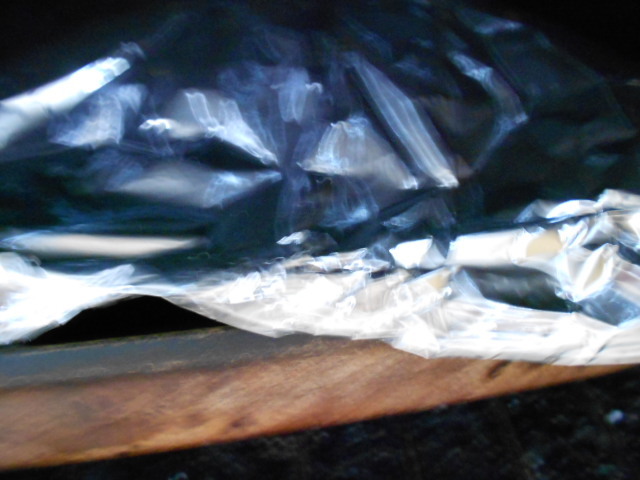 Take the meat out and let it rest for at least 30 minutes – if any longer cover with Silver foil to keep the heat. 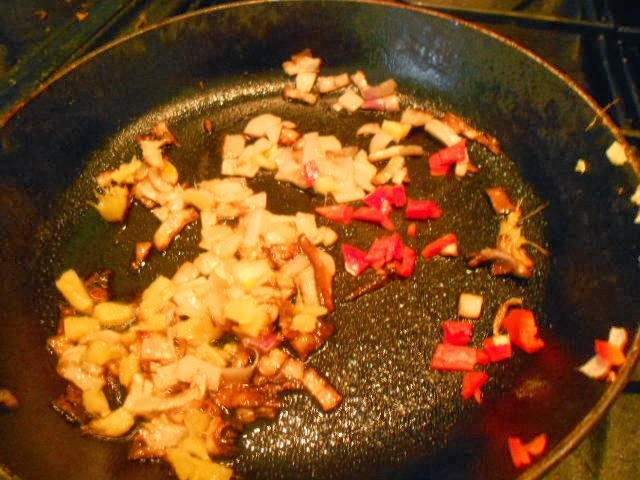 Meanwhile using the onions and all the delicious scrapings in the pan. Mix in a spoonful of flour which has been mixed with water. Stir it in till there are no lumps of flour. 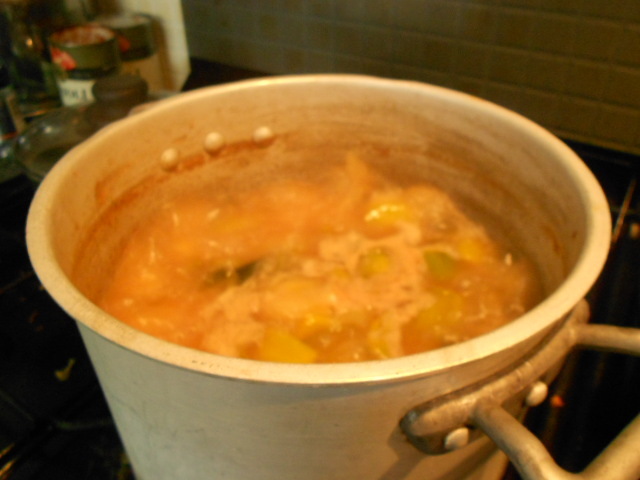 Add the stock cube, redcurrant jelly and the wine and mix well; over the heat. If like me you use pampered chef stoneware which cannot have direct heat I put it in the oven remembering to stir regularly. I used the left overs for sandwich fillings and cold meat platters, the kick added to the beef was delicious but not at all overpowering. Enjoy, do you add anything else to your joints – let me have a try?